I cook such a variety of stews with an eggplant base; I’m audaciously naming this stew after myself. Alesinka is the Polish-ized nickname my mother gave me growing up. Well, it’s the nickname that lends itself better for recipe naming purposes. I don’t think too many people would be keen on eating a recipe named “Poison Mouth,” the nickname I acquired in my teenage years. Hear ye, hear ye! 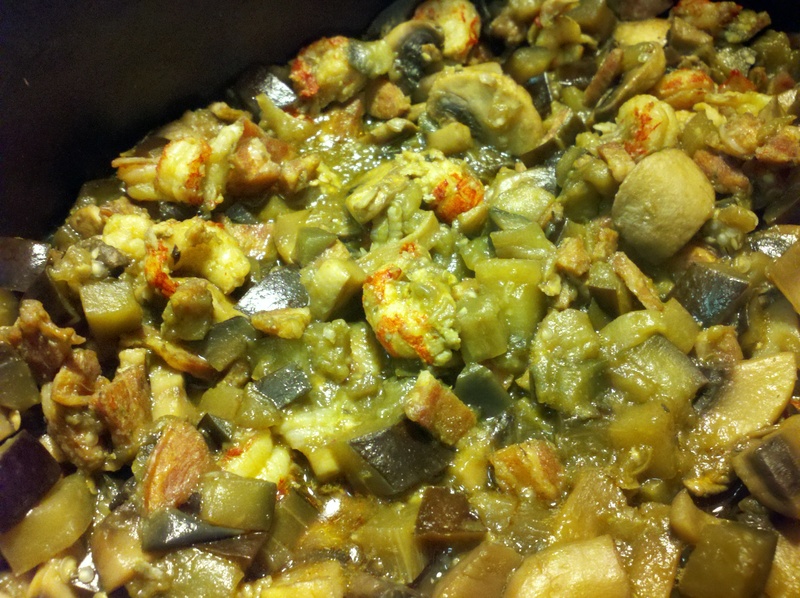 Stew with an eggplant [and smoked sausage] base is hereafter known as THE Alesinka. You heard it here first! This particular recipe is a result of my walking through the grocery store ravenous, thinking just about anything could go into a stew pot with eggplant. I finally settled on mushrooms and crawfish. 1. Sauté the pork and crawfish sausage [the fattier of the two sausages] until it releases some fat. 2. Add enough water to cover the bottom of the stew pot. 3. Add chopped mushrooms and cook until they begin to darken. 4. Add diced eggplant [and more water if necessary, to cover bottom of pot]. 5. Cook until eggplant has begun to soften and release water, approximately 20 minutes. 6. Add remainder of chopped sausage. 7. Simmer ingredients for 20-30 minutes to meld flavors. 8. Add crawfish tail meat and cook another 10-20 minutes.